This is about a man who works for a low salary at a tire manufacturing company. The court has condemned him to pay his wife’s marriage portion and Reza is trying to get that money. Finally, he remembers that another worker had lost a finger in work and this gives him a new idea how to make that money. Peiman Haqqani, the director, is not a known figure in the Iranian cinema. He is interested in independent cinema and his first feature was in black and white. It is clear that The Man Who Ate His Cherries has not been made for public screening in Iran and production costs have been kept down. Such films are not usually accompanied with much ado and nobody is very sensitive about following news on independent films save for those which are made by a famous director. Producer is Amir Samvati who has already produced a number of independent and valuable Iranian films. 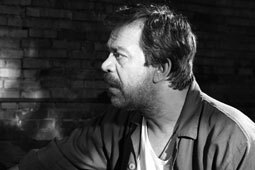 His most acclaimed works include Deep Breath (Parviz Shahbazi) and Transit Café (Kambozia Partovi). Crewmembers of The Man Who Ate His Cherries include Peiman Haqqani (director), Hamid Reza Kashani (screenwriter), Farshad Mohammadi (director of photography), Mehran Malakouti (sound recordist) and Behrang Sanjabi (editor). Hamed Behdad, Hassan Pour-Shirazi, Asha Mehrabi and Reza Afshar have been cast in the main roles. The first two are among famous cinema and television actors.